Mind-Journeys are visualisations written for a specific purpose. 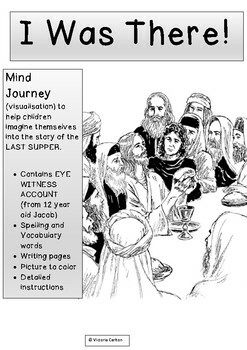 This one is written to help students imagine themselves into the picture- in this case into the original LAST SUPPER scene. Seat children on the floor in a darkened room and make sure there is nothing to distract them. Tell them they are going to go way, way back in time to see Jesus celebrating the LAST SUPPER with his disciples. Ignore minor distractions as you don’t want to stop the visualisation happening in children’s minds. At the end ask children to open their eyes, wiggle their fingers and toes and bring their minds back into the present. 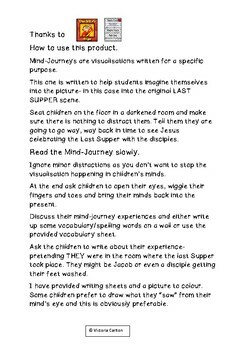 Discuss their mind-journey experiences and either write up some vocabulary/spelling words on a wall or use the provided vocabulary sheet. 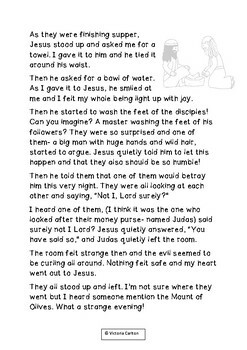 Ask the children to write about their experience- pretending THEY were there as Jesus passed by. 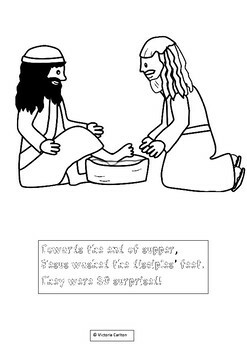 I have provided writing sheets and a picture to colour. Some children prefer to draw what they “saw” from their mind’s eye and this is obviously preferable.